The Queen and the Duke of Edinburgh welcomed The President of the United Mexican States, Señor Enrique Peña Nieto, accompanied by Señora Angélica Rivera de Peña, at the beginning of his State Visit to the United Kingdom. For more: Express article, Daily Mail photos, Zimbio gallery. Instead of going brooch-less (perish the thought!) she moved it over to the other side to avoid her dress decoration. And then: State Banquet time! The very best time, of course. 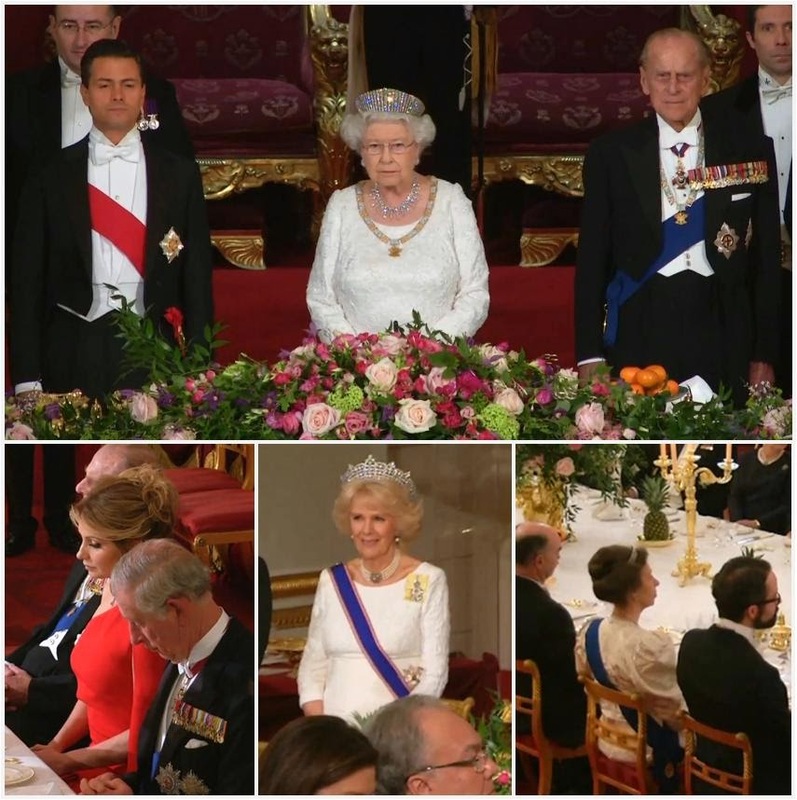 The Queen, along with other members of the Royal Family, gave a State Banquet at Buckingham Palace for The President of the United Mexican States. Diamonds and white, of course. But I do note that this is the first time since this blog began (2012) that we've seen Queen Alexandra's Kokoshnik Tiara worn for a current event, and I did not think it had been that long. Extra kudos to the First Lady, who looks absolutely fantastic (just as she did for the welcome ceremony). A few more photos from the banquet have come out. Looks like we have the mysterious Diamond Cluster Earrings on The Queen. And below, you can juuuuust see that The Duchess of Cornwall appears to be wearing the Greville Tiara (no shock there). She is in her normal spot, right next to the President at the head table. Video of The Queen's speech! You have to respect the wall of sparkle that is the Kokoshnik.